Custom Sprites – Bred and Dug get two new sprites added to the Capcom page but there will be more. I’ll explain in a bit. A new Power Girl sprite edit was added to the DC gallery. Mini-logos – Joe & Mac (separate logos, of course), Kage (the Legend of Kage), Kung-Fu Master, Mappy, Metroid (NES and Super Metroid style), Twinbee, the Punisher, Swamp Thing, She-Hulk. … I decided to make more. This is one of the things I posted a teaser image of a while back. 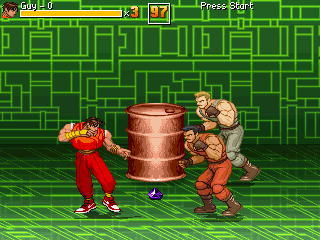 I’m working on a Street Fighter Alpha-ish sprite set of Bred and a head-swapped Dug to go with it. I’m resizing arcade F.F. sprites by 112% and tracing the linework while giving it a more SFA look. Some poses, like the jump, are being redone altogether. This will not be an insanely fluid set of sprites although I am adding transition frames to every animation. This is a slow burn project since I’m also working on a comic book right now but expect Bred and Dug to be finished early this year. 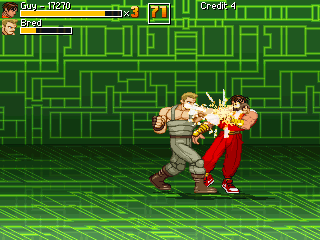 I already have a demo test of him using OpenBOR and I’ll try to make a video of this as soon as I can. This is the big reason why I’m not going to update the sprite galleries for a while since it’d make more work for me to convert the pages to the new gallery data style. I’ve also been working on more of those rectangle graphics that you see in certain parts of the site.